Intelligent cars that drive and park themselves. Bandages that are capable of telling whether a wound has healed. Retail systems that monitor where shoppers linger. Thermostats that detect the homeowner's arrival and turn up the heat. All these devices - relegated to the future not too long ago - are already up and running, a part of the Internet of Things (IoT). Just take the new central government's plan of developing 100 smart cities, for which Rs 7,060 crore has been provided in its first Budget: Even if this only partially succeeds, it could lead to a massive and rapid expansion of IoT. Quick progress on this front will not come a moment too soon. India has a negligible number of machine-to-machine (M2M) connections compared with China's 50 million - the highest number globally according to a GSMA study. In India and beyond, companies are competing to provide the hardware, software and services to implement and expand these scenarios. If the past is an indicator, they may not be the same companies providing them today. We expect to see the leaderboard reshuffled. The winners will develop high-value, repeatable solutions at the intersection of mobility, analytics and cloud computing, creating new sources of value. All of this activity will generate tremendous opportunity across many industries such as telecommunications, software/IT-enabled services and consumer electronics. AT&T's global partnership with Wipro for M2M roll-outs across sectors is an example of how some prescient Indian players are already capitalising on this trend. Globally, according to various studies, direct investment in hardware, software and solutions could top $70 billion by 2017, with related opportunities possibly offering as much as $1.4 trillion. Some industries are already using pervasive computing at scale. 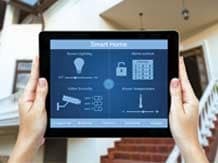 In many developed markets, utilities are investing significantly in smart grids, smart meters and smart thermostats, encouraged by regulators and enabled by established standards. Connected cars will soon be more pervasive with multiple original equipment manufacturers recently announcing tie-ups, such as Tesla Motors with Spain's Telefónica, General Motors and AT&T, and Vodafone's acquisition of Italian car electronics player Cobra Automotive Technologies. Back home, Mahindra, in collaboration with Vodafone, is leading innovation with its M2M-enabled e2o electric car. In many developed markets, privacy concerns and industry fragmentation are creating barriers to unlocking new value in healthcare from pervasive computing solutions. In India, however, with the significant upsurge in lifestyle diseases such as diabetes and high blood pressure, the evolving remote healthcare ecosystem can leverage IoT for preventive care and disease management. Broadcom, for example, recently announced that it is betting on the Indian market for wearable devices for fitness tracking, vital stats monitoring and individual safety. As with other technology shifts, we expect the first comprehensive solutions to be designed for specific industries - transport and smart homes, for example. That focus allows developers and designers to work within a limited construct of requirements to solve complex problems of association and management across multiple layers and thousands of devices. Companies that create affordable, end-to-end offerings will make it easier for others to invest in the next wave of computing. Over time, we'll see platforms emerge within sectors, followed by cross-industry solutions. As these platforms emerge, companies creating pervasive computing solutions at the infrastructure and database level will need to manage the interaction of millions of sensors and find ways to cost-effectively collect and analyse the huge volumes of unstructured data they produce. This offers Indian analytics' service providers a great opportunity to provide the backbone for advanced analytics solutions across IoT vertical solutions. However, India will need to overcome its infrastructure deficit (e.g. unreliable telecom coverage, intermittent power supply, limited 3G adoption for high bandwidth applications) to capture the significant economic value creation opportunity that IoT presents. Where does the value lie: in hardware (advanced servers, new chips), in software and services, or in the data itself? Which solutions will meet customer needs and offer a compelling case for investment? What capabilities do we need to develop and deliver these solutions? Who should we partner with in the value chain? Which standards should we back? What are the risks of not acting? The next three to five years will be critical as pervasive computing moves into the mainstream and the number of connected devices skyrocket. Executives across the technology industries that will implement this shift should focus on answering the critical questions today that will position them for leadership tomorrow.